'Quality has to be caused, not controlled.' This is primarily restricted to etching the numbers on to our clock dials but it can also be used for dedications, dates or for decorative patterns. The process is quite simple, involving the scraping away of the leaf, to expose the black boll underneath, using a scribing tool, rule and compass. Having said this it requires a good eye, a steady hand and a great deal of patience and care. One of the 330 diameter round clock dials takes around three hours to etch. It’s slow but enjoyable work -especially with Radio 4 to keep you company. I have tried screen-printing on the numbers, which is a lot quicker and easier, but the numbers do not look right. 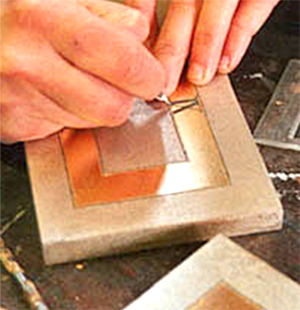 By etching the numbers they appear more in keeping with the hand made character of the piece.